The 2015 Volkswagen e-Golf Review: The Volkswagen Golf has been sold around the world for 40 years. A mainstream model in Europe, it is less central to VW’s model mix in the U.S. However, with a major redesign for 2015 comes Volkswagen’s first all-electric car, the e-Golf, and it was worth the wait. The new e-Golf is aimed right at pure electric vehicles like the Nissan Leaf. There is no sacrifice in driving enjoyment or practicality in choosing the electric option. In fact, it boasts the same 95 cubic feet of capacity as the gas version, with its battery tucked away out of sight. 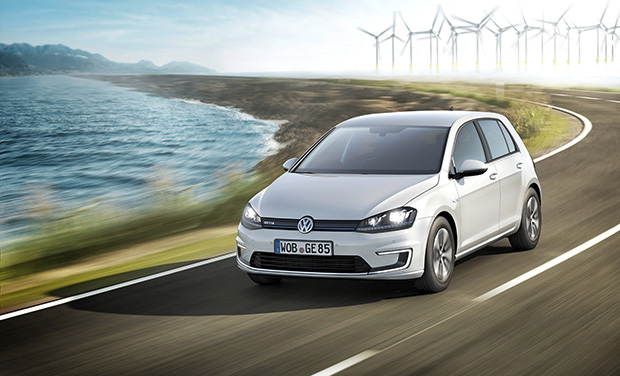 The e-Golf’s motor puts out 115 horsepower and 199 lb.-ft. of torque through a single-speed automatic transmission. Having just tested the sporty Golf GTI model a few weeks before, I could sense that this electric version still delivered the same fine Golf road feel, and at 3,391 pounds, didn’t feel sluggish. Although it didn’t rocket ahead like a GTI, at 10 seconds from zero to 60, the feel of electric motor-driven acceleration is instant and exciting. Naturally, the driving range of an all-electric vehicle is at the top of any driver’s mind. The e-Golf gets an official rating of 83 miles, but when I charged the car up, I saw a reading as high as 98 miles on the instrument panel gauge. How you drive, what kinds of roads you drive on, and how you program the car’s adjustable settings make some difference, but this car didn’t feel like it would leave you in the lurch. To ease your range anxiety, VW provides a roadside assistance program. If you run out of charge within 100 miles of home, they will take your car to a charging station and to get you home via taxi or other transportation method on their dime. To maximize your e-Golf’s efficiency, there are three driving profiles: Normal, Eco and Eco +. The latter two progressively lower the horsepower and top speed, change the accelerator action, and in the case of the Eco + setting, turn off the climate control, to reduce energy consumption. You can also program the amount of regenerative braking to generate a small amount of juice in the normal setting or produce progressively more in two other settings. VW provides the VW Car-Net app, so you can keep track of your charging, turn the climate control on or off remotely, and monitor performance data for your car. Part of owning an electric is the science project aspect, where you are thinking about what your car is doing rather than just sitting in it and going. It’s important and fun, too. Charging is simple. However, using household 110/120 volt current, it could take you 20 hours to fill the battery from empty. A 220/240 volt charger, which you’d install at your house if you owned the car, can do it in less than 4 hours. The e-Golf comes with the SAE combined quick charge socket, so you can get an 80 percent charge in 30 minutes in a pinch. It’s particularly quiet inside the e-Golf because when VW removed the vibration-causing gas engine, they went after the little sounds that could annoy you, which were suddenly exposed. The car emits a little sound at low speeds, so oblivious pedestrians are warned of your approach. Part of owning an electric is the knowledge that you’re reducing your carbon footprint and helping the planet. In that spirit, VW has teamed up with 3Degrees, a renewable energy service provider, to offset the e-Golfs greenhouse gas emissions from its production, distribution, and 36,000 miles of charging. My Pacific Blue tester was a delight. Electric motoring is smooth and pleasant. With an 11-mile commute, I had plenty of charge left over at the end of the day. This would be an ideal commute vehicle, with its quiet, spacious interior and gasoline-free ways, but as with any other electric car, except a Tesla, you’ll need another car for long trips. But with the federal and state tax rebates available that help mitigate some of that cost as well. The Bottom Line: The VW Golf is all-new for 2015, but still looks familiar. It’s a two- or four-door hatchback and new for this year, it takes on the wagon role from the Jetta. Numerous engines and trim levels are available, but you can tell the e-Golf by its blue accents. VW first sent the e-Golf to market as the loaded SEL Premium model. That means full climate control, heated seats, leather steering wheel and shift knob, alloy wheels, heated mirrors, and the like. Now, VW has just released the Limited Edition, which shaves $2,000 off the $35,445 base price by swapping out the alloy wheels for steel, LED headlamps for standard halogen, and cloth seats in place of leatherette.